On archaeological and epigraphically grounds we cannot definitely establish the historical importance of Puri before the 7th Century A. D. There is a commonly prevalent notion that the temple of Lord Jagannath is situated on a blue mountain and therefore called Niladri, Nilachal or Nilagiri. But we find no mountain at Puri or any reference to a hill or a mountain near Puri in the history, it can be presumed that it might have been built on a sand hill called Niladri or the Blue Mountain only on the grounds of analogy. There was a small Jagannath Temple before 12th Century A.D. where the present temple is situated. As the old temple became weak and starts damage, the King “Raja Ananta Varman Chodaganga Dev” decided to build a new temple. It is believed that the present temple built on the garbage of old temple. Because of the height of the base of the present temple is more than 30 feet. The founder King of the Ganga Dynasty, King Chodaganga Deva began it’s construction of the celebrated Temple of Lord Jagannath now existent at Puri in 1235 A.D.. The construction was finished by King Anangabhima Deva. 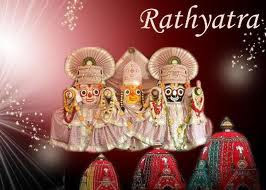 The wooden images of Jagannath Balabhadra and Subhadra were installed in that temple. The management of the temple continued under the Hindu rulers till 1558. Then the State of Orissa was conquered by the Afghan Nawab of Bengal and the temple was attacked by the Afgan General ‘Kalapahad’. At that time, an independent Khurda kingdom was established by “Ramachandra Deb”, who assumed the management of the temple. He consecrated the temple and reinstalled the deities. Till 1760, the temple continued under the Khurda Raja (King), who was paying tribute to Mughals and Marhattas. Raja Mansingh, a General of the Mughal King Akbar, defeated the Afghans and annexed Orissa in to the Mughal dominion. It remained under the Mughals till 1751 A.D.
Then Marhattas took up direct management of the temple till 1803. The British annexed Orissa into British Empire in 1803 and allowed Puri Raja to manage the temple. . However, to the credit of the British it must be said that they respected the right to worship of the Hindus at Jagannath and indirectly allowed patronage. They recognized that Jagananth Puri's King of Orissa (Gajapati Maharaj) as the Superintendent of the Temple and granted some revenue rights and privileges to the temple to run it's affairs. The position continued till 1947.